He's the cute little stray that swims all day just put him in the water and watch him go! 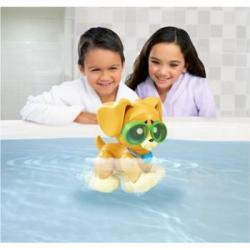 Online Rescue Pets Swim to me Puppy commercial by Presley. Take him out of the water, and watch this playful little pup walk around. Puppy comes with pair of goggles, towel and adoption certificate. Fill out and register the adoption certificate online. Requires three "AA" batteries, not included. Measures 9" tall.